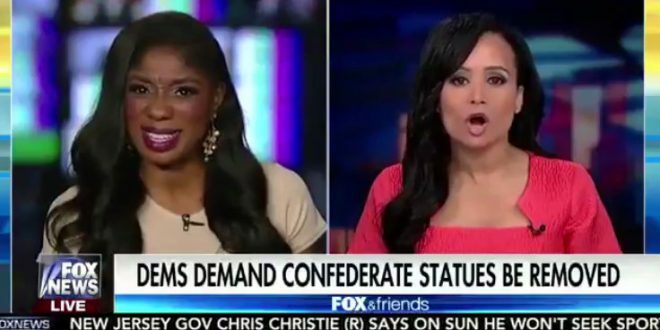 Former Trump Spox Katrina Pierson Calls Slavery "Good History" In Wildly Off The Rails Fox Segment [VIDEO] - Joe.My.God. Former Trump campaign spokesperson and convicted shoplifter Katrina Pierson has (for the moment, at least) reclaimed her title as the nation’s most idiotic Republican after literally calling slavery “good history” during an off-the-rails segment on Fox News today. It all started with a debate over House Minority Leader Nancy Pelosi’s push to remove Confederate monuments from the U.S. Capitol in the aftermath of the Charlottesville white-supremacist rally that turned deadly. On the other side was Wendy Osefo, the left-leaning half of Fox & Friends’ most devastating segment the week before, who pushed back fairly gently against Pierson, saying the statues belonged in museums, not on state grounds. But it was this comment from Pierson that caught Osefo’s attention: “It absolutely deserves a place, because bad history is still good history for this country.” “Slavery is good history?” Osefo asked in disbelief. Now, while most reasonable persons would respond with an emphatic, “of course not,” Pierson went a different direction. “Considering where we are today! Where we are today! Absolutely!” she said. “Slavery is good history? Absolutely? Oh, wow,” Osefo shot back.